Almost 10,000 people tuned in the VCE virtual launch today to hear about the biggest launch in the three year history of the company. For a detailed review of what was announced, I suggest reading Kendrick Coleman’s blog. Among the products that was unveiled is the Vblock Specialized System SAP HANA, which elevates the capabilities of a converged infrastructure system to a whole new level. An application that is certified and designed to run optimally and efficently on the Vblock. A Specialized System is built from the ground-up to provide predictable performance and scaling for the application that it is hosting. An application that is installed and configured in the factory, along with the physical and logical build of the Vblock, prior to delivery on to customer premises. A customer receives an application appliance that basically works right out of the box in the same way a new MacBook is expected to work when you purchase it and take it home. A VCE release matrix that ensures any firmware changes to the underlying Vblock system will work with the certified application being hosted. VCE, therefore, can mitigate the risk that seem to be inherent with every firmware change. A single support number that provides a seamless support experience for the entire Specialized System, from the hosted application down through the entire infrastructure. No more finger-pointing when a customer experiences functional or performance issues in the application or infrastructure layers. Strong partnership between VCE and the hosted application’s vendor, which can potentially create differentiated integration between the application and infrastructure layers. In the future, it may be possible, via Vision Intelligent Operations, to provide end-to-end monitoring of the Specialized Systems as well as dynamic provisioning of the infrastructure based on the changing needs of the application. The Vblock Specialized System can be thought of as the instantiation of the Vblock as THE optimal application delivery platform. Why is this important? Because delivering a converged infrastructure is not the end goal; enabling the business is what is important. And for IT to do that in this age of next-generation, web-scale applications means enabling agile software development and application delivery. The overall value proposition of a Vblock Specialized System is it’s ability to become the platform for delivering this type of service to the lines of business and to the associated application owners. 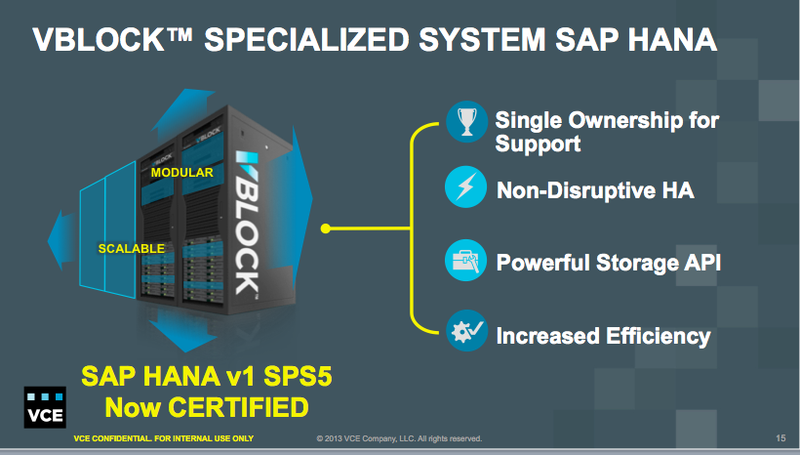 As was alluded to on the call today, SAP HANA is expected to be only the first of many applications that will receive the Vblock Specialized System treatment. More Specialized Systems will be rolled out that enhance the delivery of applications from VCE’s ISV partners and investor companies. 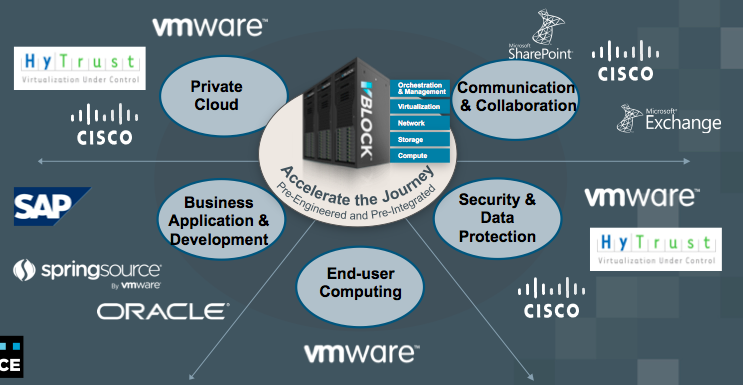 Future applications that may become part of the Vblock Specialized Systems portfolio include Cisco’s Unified Communications, VMware’s View, or Pivotal’s Greenplum. As more Specialized Systems are released, it may be possible to integrate multiple certified applications into a Vblock-based specialized solution that provides all the Specialized System value propositions listed above. One such potential specialized solution could be a platform for delivering a Platform-as-a-Service (PaaS) that accelerates the development and delivery of next-generation, web-scale applications. This specialized PaaS, pictured above, leverages solutions from the soon-to-be-formed Pivotal and from EMC, certified on and with a Vblock. 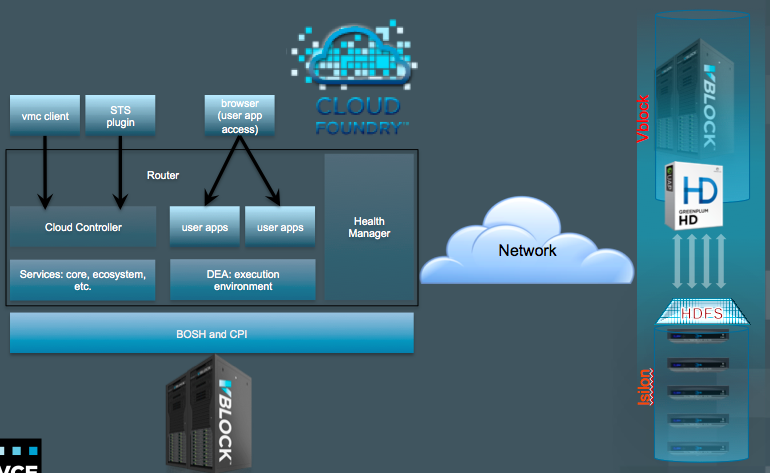 At a high-level, Cloud Foundry, leveraging their open sourced BOSH tool chain and Cloud Provider Interface (CPI) to communicate with Vision Intelligent Operations, would enable the Vblock to become a Private PaaS for the development and delivery of next-generation applications. Integrated with Greenplum Hadoop and EMC’s Isilon scale-out NAS, the Vblock would also provide the Big Data processing engine and HDFS store required by the application frameworks hosted on Cloud Foundry. Together, this would create a platform for application development that offers similar services to those provided by Public Cloud vendors, such as AWS, Google App Engine, and Heroku. However, this Private PaaS would offer unparalleled performance, availability, and support. I don’t know and cannot promise that these Specialized Systems or solutions will ever see the light of day. However, the potential for Vblock Specialized Systems seems almost limitless. So stay tuned! Next Which Amazon Are You Chasing?